Just passing on the news that Guide Dogs Victoria's open day is coming up. On Sunday 1 March 2009, Guide Dogs Victoria, Kew will open its doors once again for Open Day! For over 11 years, Guide Dogs Victoria’s annual Open Day has been entertaining kids and adults alike with a range of fun and educational experiences. Guide Dog’s famous Open Day enables members of the public to get a behind the scenes look at how Guide Dogs are bred and trained to become the eyes and faithful companion of blind and vision impaired Victorians. The day, attended by over 12,000 people in 2008, offers live entertainment, gorgeous puppies and working dog demonstrations, food stalls, doggie products and more. There will also be a special guest appearance by Wags the Dog! 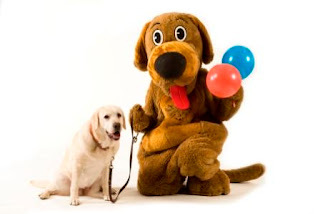 Guide Dogs Victoria provides a range of mobility services to people who are blind or vision impaired, including Guide Dog Mobility, Children’s Mobility and services for people whose vision loss results from an acquired brain injury such as stroke. With minimal government funding, Guide Dogs Victoria relies heavily on the generosity of Victorians to continue to provide services completely free of charge. Services are available across metropolitan and regional Victoria. Chandler Highway, Kew (Melways Ref 45 B1). 10am-4pm - entry is via gold coin donation.